With superior quality materials, WATERFLY sling bag is waterproof, tear resistant and durable enough for your daily use; breathable mesh strap and charming appearance make it comfortable and fashionable. Equipped with one main pouch and 4 small pockets, WATERFLY sling bag can easily hold iPad 4/5/6, A4 magazine, iPhone 6 plus, water bottle and other necessities while travelling or cycling. 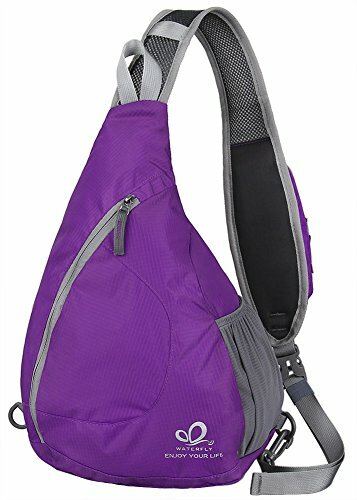 This unisex chest sling bag is suitable for outdoor cycling, walking, hiking and travelling, it is the best choice for day trips and outdoor sports. UPGRADED DESIGN - Compared with other ordinary sling bag, this chest bag adopts upgraded design, reinforced strap, flawless strap zipper bag and perfect workmanship make it your best choice! If you have any questions about this product by WATERFLY, contact us by completing and submitting the form below. If you are looking for a specif part number, please include it with your message.